How did you “write” and deliver punchlines that got you laughs before you made the decision to take a shot at stand-up comedy or public speaking? Secret: “Writing” and “talking” or expressing oneself verbally are two very different forms of communication. It is because of these significant differences that “writing” is not effectively interchangeable with “talking” when it comes to producing spoken word comedy material that actually works in the live audience environments. You didn’t develop the sense of humor and comedy talent you have right now from passing written notes back and forth to countless people you have come in contact with over the years since you started talking as a child. And I would be willing to bet that you have never experienced any sort of “talkers block” when you were making friends, family, neighbors, coworkers, classmates, etc. laugh using your own unique sense of humor. Help you understand what a punchline is relative to you and your sense of humor – from a spoken word perspective. I feel very strongly that you have the ability to be much better prepared to tap into your already developed comedy talent on a professional level if you understand the mechanics of what you do to make others laugh in everyday life. Important: Please be aware that there is much to know when it comes to developing a tight stand-up comedy routine or funny speaking presentation from conception to final delivery for a live audience. That sort of comprehensive step-by-step instruction is provided in my online course. 1. Use any search engine to search the term “differences between talking and writing”. You will be able to easily see for yourself that there are significant differences between writing and talking. Note: One of the reasons that the vast majority of stand-up comedy books, classes and workshops are ineffective when it comes to helping someone harness their “spoken word” talent is because their approach comes from a “written word” perspective and not a “spoken word” perspective. 2. Simply sit through a couple of stand-up comedy open mics from beginning to end, keeping in mind that most of those folks are like you and have more than enough comedy talent to do well on stage — if they actually knew what they were doing when it comes to effectively developing and delivering a big laugh stand-up comedy routine. Simply knowing that punchlines are the funny part of a joke has no actionable value. In other words, it doesn’t help you understand what punchlines are or how they are generated as they relate to you and your sense of humor. 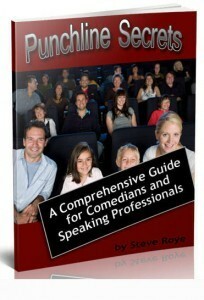 However if you wish to pursue the whole “writing designed for an individual reader as a substitute for talking and expressing oneself naturally for live audiences” approach, you simply need to get your hands on most any other resource on how to produce comedy material. It’s your comedy talent – how you decide to manage that is completely your call. This entry was posted in CU Blog Articles by Steve Roye. Bookmark the permalink. ← Previous Previous post: Under 21 And Want To Become A Comedian?